Two U.S. Marines were reportedly wounded while tackling a Kalashnikov wielding man of ‘North African origin’ on a train in France late Friday afternoon. The train was bound for Paris from Amsterdam. One other passenger was reported wounded. 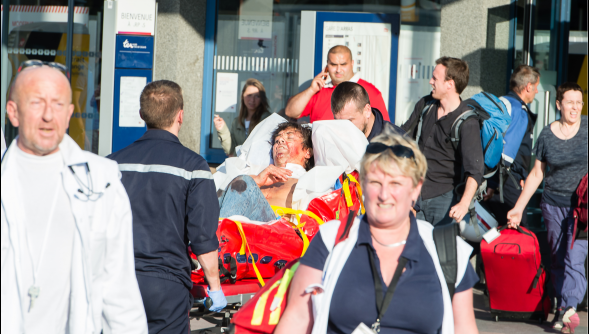 AFP reported a spokesman for the French state railroad company SNCF said the injuries were serious. Wounded passenger being removed from train. Photo via Voix Du Nord. UPDATE: AP reports the suspected gunman has been identified.